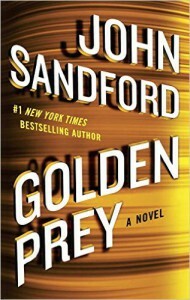 It's been several years since I have read one of Sandford's "Prey" novels. I'm happy to say that I picked the right one to jump back into the series. This was a highly enjoyable book, and I had a hard time putting it down. Sandford's protagonist, Lucas Davenport, has found himself in a new and exciting position. He has now been assigned to the U.S. Marshal's Service, as a special appointee. This move has allowed Sandford to move beyond the Minnesota area and expand the scope of Davenport's adventures. Golden Prey's focus is on the robbery of a drug money counting operation, the people who stole the money, the cartel employee's trying to get the money back, and Davenport's team trying to apprehend them all. The novel moves across several states in the South, ending in the finale in Texas. The novel moves along very fast, with action in every chapter. The characters are well developed. The action sequences are loads of fun. And the novel ends well, with enough of a teaser to keep readers coming back for the next one. All in all, a great, fun read!